Every evening during the meeting, at the end of the prayer, Brother Alois spoke to the participants. You can find the texts of these meditations on this page. We have come to Strasbourg as pilgrims of peace and trust—in this city, in this region of Europe, which is today a symbol of reconciliation after the terrible wars of the twentieth century. We would like to thank those who are welcoming us straightaway. What wonderful hospitality! When you return tonight, say this to the families who are hosting you. The fact that the young foreigners who have come to the meeting are all being welcomed into families on both sides of the border is a sign of hope. We have just heard, in the Gospel reading, Jesus call Levi to follow him. This story should challenge us. Levi decided without hesitation to follow Jesus. Then he prepared a great meal involving all different kinds of people. What we would like to discover these days is a kind of image of this meal at Levi’s house. Setting out to follow Jesus, we understand that, at his table, there is a place for all, and therefore for each one of us. Not because we measure up to his call, but because he loves us. Jesus even gives the place of honor to those who seem to be far from God, or who feel far from God. Jesus offers his friendship to all. And this friendship that Jesus shows, we can also live it among ourselves. Those who love Christ over all the earth form, in his steps, a kind of great community of friendship. To create and to strengthen a community of friendship: is that not a contribution that Christians can make to the future of our societies? There are so many challenges to face: unemployment, economic insecurity, the gap between rich and poor within each country and between nations, and related to this, the degradation of the environment. Many young people aspire to another kind of economic organization. Is it possible to find answers to these challenges without beginning by first creating bonds of friendship? Christ, through the Holy Spirit, invites us to leave behind the spirit of rivalry, which brings about oppositions and injustices, and become creators of friendship, peacemakers. Christ calls us all to widen our friendship. And we can do this very simply, as Jesus did, by a shared meal, by a visit, and especially by spreading forgiveness and trust all around us. Throughout our lives, we can be pilgrims of trust. Tomorrow morning you will reflect together. You have found in the meeting booklet four proposals for 2014. They will help you these days, then when you return home to your different countries, to seek visible unity, friendship, among all those who love Christ, in other words those who put their trust in Christ and also, in addition, to all those who want to be witnesses to friendship in the world. Today, you asked yourselves how to create bonds of friendship. But we would like to go further: to go to the source of this friendship. These days could then be an opportunity to deepen our faith. In the Gospel we have just read, Christ calls us his friends. This means that the love of God is always offered to us. His love is at the source of every other love, of all friendship. Our faith in this love of God cannot remain a vague feeling with which we would be satisfied. Our faith needs to become an adult faith. In our quest to understand the love of God, we may sometimes be tempted to give up because we feel overwhelmed, or because all our forces are absorbed in organizing the concrete details of our existence. Faith is not a system that would offer an explanation for everything. God does not simply act to meet our expectations, neither in our lives nor in the world. So in each of us doubt can coexist with faith. Perhaps, over time, we become more sensitive to the incomprehensibility of God. That should not scare us! Instead, it can lead us to dig deeper to find the source of trust in God. Experiencing sufferings and failures can lead us to trust more deeply in the love of God which is beyond everything, which is beyond our control. How can we find this trust? Two approaches support us. The first is to be silent before God. Of course we can, like children, express our requests to God in prayer. But we can go even further than that! Prayer is not only asking for this or that, but opening ourselves to God in the silence of our hearts in order to put ourselves under his loving gaze. If Christ calls us his friends, that is because God is waiting for our love. Yes, I am fragile and imperfect, but God is begging for the love that I express to him in my poor prayer. The second approach: to look at Christ, to listen to him. Even though he was the Son of God, Jesus experienced God’s silence. By his death and resurrection he took upon himself all the tragedy of our lives—our failures, our faults, our violence. Even in the darkest night Jesus believed in the love of God. So he can guide us, not so that we may be spared darkness, but in order to pass through this darkness with us, ensuring us of the invisible presence of the Holy Spirit. And the love of God brings fulfillment to our lives to the extent that we pass it on to others. Let us take seriously the words of Christ that you will reflect on tomorrow morning: "Love one another." And those other words: "Love your enemies." What a challenge! But what power too! Let us resolve to welcome God’s love and allow it to transform our lives. If you love one another, Jesus said, everyone will know that you are my disciples. Last night I told you that Christ calls us to widen our friendship to those around us. During the recent pilgrimage that I made in Asia with a few brothers, we met Christians, especially young people, who are attempting to be such witnesses to friendship. In most Asian countries, Christians are a minority. But many of them are ferments of peace and freedom in the situations where they have been placed. I saw that in Myanmar, in India; I saw it in China. These Christians carry a word of encouragement that I would like to communicate to you. In Korea, I realized the suffering caused by the separation of the country into two states. It takes courage to take steps of reconciliation, and more and more people have the courage to do this. In North Korea, we could only share the silence of those who are waiting for things to change. Let us pray for the people of that country! (at the beginning of the prayer): Ecumenical openness is a long tradition in Alsace and Ortenau. We thank the Catholic, Orthodox and Protestant bishops, pastors, priests and laity for many ecumenical initiatives which marked the preparation of our meeting in Strasbourg. Thank you to Archbishop Grallet, to the Protestant Bishop Fischer, to the Orthodox priest Father Vasile Iorgulescu, to President Collange and to Archbishop Zollitsch who will now speak to us in five voices. (at the end of the prayer): In the coming year we will ask ourselves: what must we do for the Church to be more a communion? So many people, suffering from the stress of daily life, are seeking spiritual comfort, are thirsting for inner peace. What can we do so that, through its life, the Church may allow the wellsprings of the Gospel to appear, from which people can come to quench their thirst? We would love to see this image of the Church take shape, the one Brother Roger described with these words: "When tirelessly the Church listens, heals and reconciles, it becomes what it is at its most luminous: a communion of love, of compassion, of consolation, a clear reflection of the Risen Christ. Never distant, never on the defensive, liberated from all harshness, it can radiate the humble confidence of faith right into our human hearts." So that the Church may become more and more clearly such a place of welcome and communion, is it not time to take further concrete steps of reconciliation between separated Christians? Reconciled Christians allow the voice of the Gospel to be heard so much more clearly, in a world that needs trust in order to prepare for a future of justice and peace. At present, we are in danger of stopping at mere tolerance. But Christ wants to bring us together in one body. So I would like to find the right words to ask Christians of different Churches: is there not a time when we should have the courage to place ourselves all together under the same roof, without waiting for all the theological formulations to be fully harmonized? Is it not possible to express our unity in Christ (who is not divided), knowing that the differences remaining in the expression of faith do not divide us? There will always be differences: some will be normal topics of discussion, others may even be an enrichment. Let us do with Christians of other denominations all that it is possible to do together; let us not do anything without taking the others into consideration. To facilitate this, we have two paths at our disposal . The first: in a simple prayer, turning ourselves all together towards the living God. The second: coming together in the service of the poorest. Then we truly proclaim the gospel together! By putting ourselves under the same roof, we should not be afraid that the truth of the gospel might be diluted. We can trust the Holy Spirit. It is not a matter of coming togetheri n order to be stronger, but to be faithful to Christ, meek and humble of heart. From him we learn that truth makes itself heard through humility. Does not Pope Francis show us the way forward by indicating that a priority for all of us is the proclamation of God’s mercy through our lives? Let us not miss the providential moment that is presenting itself to express the visible communion of all those who love Christ. Looking for ways of making this communion around Christ more visible will be tomorrow’s reflection and you will ask yourselves about the words of Jesus: "Where two or three are gathered in my name, I am there among them." Searching how to make this communion more visible, and in this way becoming better able to create a new solidarity among humans, will also be the goal of our pilgrimage of trust during the coming year. How will it continue? If 2013 has made us attentive to young Asians, the coming year, 2014, will enable us to listen to the youth of America. Our pilgrimage will have stages in April-May in Texas and Mexico, and in October in the Caribbean, where we will hold gatherings in the Dominican Republic, Haiti, Puerto Rico and Cuba. Then the next European meeting will take place from 29 December 2014 to 2 January 2015. Yesterday I told you that, if we seek reconciliation between Christians, it is not in order to be stronger. It is not to withdraw into ourselves either. No, we seek the reconciliation of Christians for this to be a sign of the Gospel, and so that it can become a leaven of increased closeness between people and between nations. Visible communion among all those who love Christ, among all those who trust in Christ, can be realized only if we set forgiveness and reconciliation at the heart of our lives . The same thing is true to create peace in the human family across the earth: there too forgiveness and reconciliation are fundamental values. In the human family, the wounds of history leave deep scars and affect people’s consciences and mentalities for generations. But the humiliations we suffer need not lead to violence. They can be healed, not by the victory of some over others, but when hearts make room for respecting the dignity of others. The recent history of South Africa offers us an example of this. Even if the path towards greater justice is still long, Nelson Mandela, by offering forgiveness, made possible a healing of the wounds that were nonetheless terrible in the past history of that country. And here in Strasbourg we recall that, in the last century, after bloody wars, a few people managed to lead France and Germany, and then all of Europe, on a path of forgiveness and reconciliation. By our meeting here in Strasbourg, a city that symbolizes reconciliation in Europe, we want to express a gratefulness for these peacemakers that can not be big enough. Without forgiveness, there is no future either in the life of each person or in relations between countries. Sometimes forgiveness seems impossible. But this momentary impossibility should not imply a definitive refusal. Maintaining, and if possible expressing, the desire to forgive is already a first step towards healing. In order to play their part, today’s youth have in any event an opportunity: to refuse to transmit to the next generation rancor and bitterness related to the wounds of history which sometimes still hurt. This does not mean forgetting a painful past, but interrupting the chain that perpetuates resentment and, in this way, gradually healing our memory by forgiveness. As Christians, we should be first in line to express reconciliation, even when humanly speaking the situation seems hopeless. Christ came to forgive everything. By taking upon himself human violence, he freed us from it. And he promises us we will find joy if we follow him along the path of forgiveness. We would also like to become more aware that the spirit of reconciliation involves sharing, a fairer distribution of the riches of the earth. We have undertaken together a path that will lead us to live out solidarity between human beings more deeply. 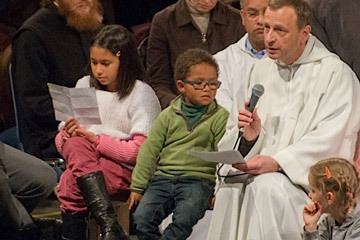 We will try to formulate these new forms of solidarity in Taizé in 2015. It would be so important for young Europeans not to be content with a reconciled Europe but to build a Europe which is open and in solidarity: solidarity between all European countries, but also with other continents, with the poorest peoples. Everyone can participate in a civilization based not on mistrust but on trust. In the course of history a few people have sometimes been enough to tip the balance towards peace. When we return home, in our different countries, let us be, because of Christ and the Gospel, among these pilgrims of peace and trust.